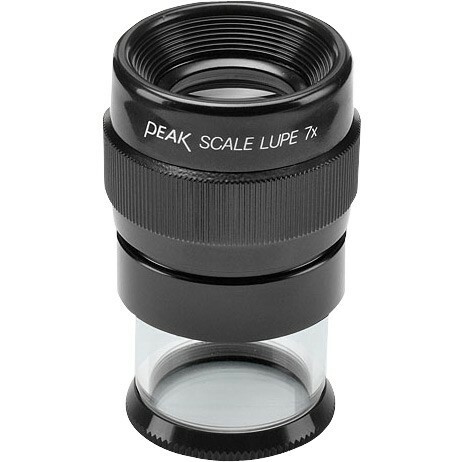 Peak Scale Loupe is a typical measurement of simplicity, accuracy and low-price. The 1975 has excellent achromatic lenses (3 elements, 2 groups) and a photo-printed precise scale. It also has a focusing ring and 7 power magnification. As all sorts of lens aberrations are avoided, you can easily read the object. In the Peak Scale 1976 Loupe 7X set combines 1975 loupe with five of the most widely used reticles, (2, 3, 7, 8, and 10) are contained in a plastic box together with the magnifier set. Special orders: Any combination of the five scales can be ordered to meet your individual requirements. When ordering a special set, Add the reticle number ( -#) in the comment section on the order form. Replacement parts are available, shown below.